A week or so ago, Jorja and I went on an exploring walk really local to us but somewhere we'd never walked before. Sometimes I just feel the urge to get outdoors, breathe some fresh air and of course take some photos. I usually have both kids in tow, but Dexter didn't fancy it that day so it was just the girls. Turns out Dex probably made a wise decision since it was bitterly cold. I was dreaming of gloves as my fingers became increasingly icy trying to turn the dials on my camera. But Jorja was loving it. 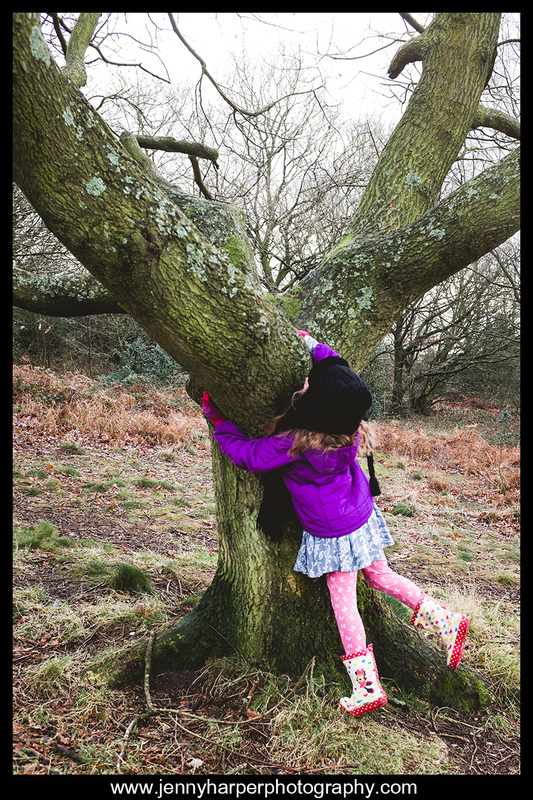 We soon came across a tree that was perfect for beginner climbing with low trunk and branches and I thought, in my continuing quest to raise a tomboy (failing for the most part! ), that it would be a great idea to encourage Jorja to try a bit of climbing. Somewhat to my surprise she agreed and was hugging the tree, scrambling up and even fancied a little lie down amongst the branches! I finally persuaded her to carry on our walk since we hadn't come far and I didn't want to stand relatively still for too long as I started to lose feeling in my toes. Everywhere we looked were climbing trees and Jorja had to try them all! She 'climbed' 13 (by her count) and even I joined her in one, caring more about the safety of my camera than myself, all for the sake of taking photos. Needless to say, we didn't cover many miles, Jorja had a great time and I got a wonderful collection of photos that will always remind me of cold fingers and toes and special time spent with my girl. Here's a selection of my favourites.